In late April, just a couple weeks after our first two hikes of 2012, K’s heel injury flared up again. Through May and June he suspended his taekwondo training and his teachers agreed to modified (low- to no-impact) phys-ed and DPA (daily physical activity). Meanwhile, we had to wait 5 weeks to see our family doctor to get a referral to a sports physician. From there, things moved relatively quickly and with a proper diagnosis in hand, he’s now undergoing physiotherapy. On Thursday, his physiotherapist suggested he start doing more weight-bearing activity, including more walking and even some light hiking. We did a 6 km walk on the pathways in Canmore later in the day on Thursday and his heel came through just fine. So today, we drove to the Wind Valley Day Use Parking lot with plans to walk into the Wind Valley, with a detour to see the remnants of a once-impressive hoodoo. What is it they say about the best laid plans? Maybe 10 or 15 minutes into our planned walk, I happened to mention that one of the specified locations for GC43F3 – Brass Cap Cache (one of our all-time favourite geocaches – a grandfathered, multi-location virtual cache) was up on Wind Ridge, which we’d be able to see from Wind Valley. That was the only prompting Mr. GeoK needed to talk the rest of us into tackling Wind Ridge instead of making the leisurely walk into Wind Valley. 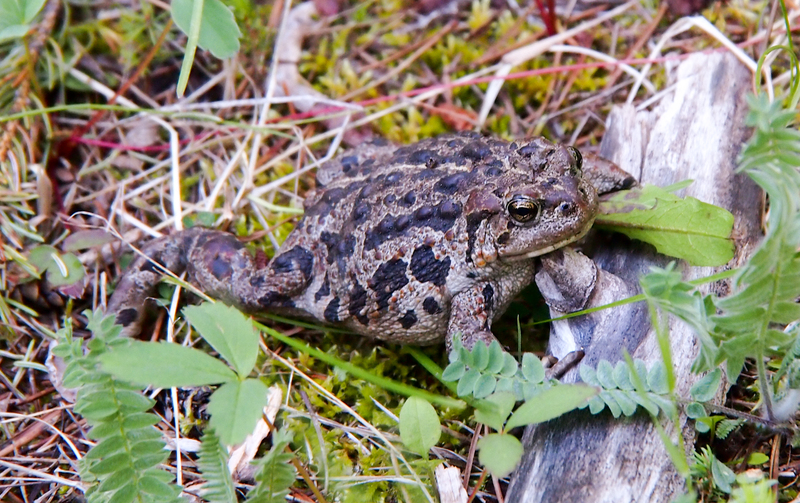 Shortly after we decided to head for Wind Ridge instead of Wind Valley, Oldest GeoKid just about stuck the end of his trekking pole into this Boreal Toad. Fortunately, it was a near miss and the toad was slow to move off the trail so we could take a couple of photos. I hadn’t really done any research on Wind Ridge, as I figured it would be “too much, too soon” for K’s heel. So we didn’t really know what we were getting ourselves into! Four hours later, after covering a total distance of 14 km with 800 meters elevation gain, we’d logged 3 geocaches, spotted a few dozen different types of wildflowers, enjoyed spectacular scenery (including some of the Monarch butterflies that are currently in the area) and said “hello” or “hi” to approximately 50 hikers slowly making their way up to Wind Ridge. 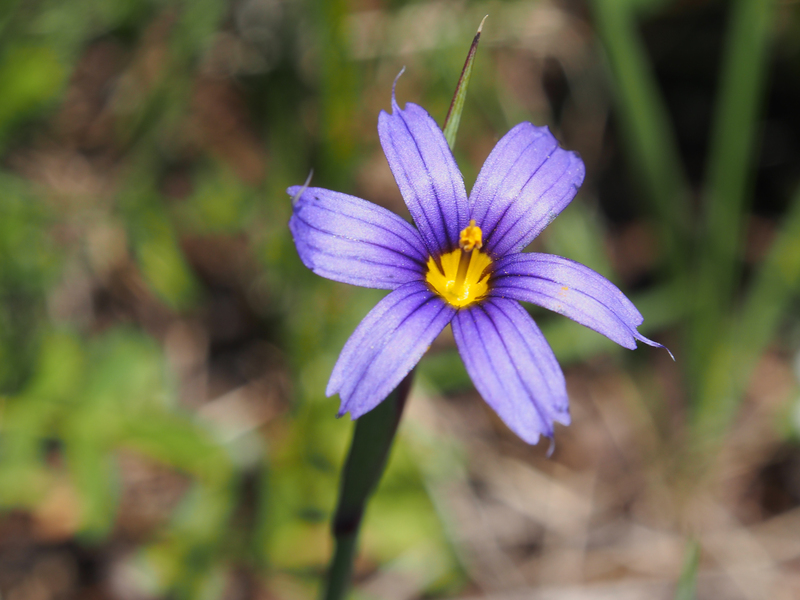 Blue-eyed Grass is one of many different kinds of wildflowers we spotted during our hike. 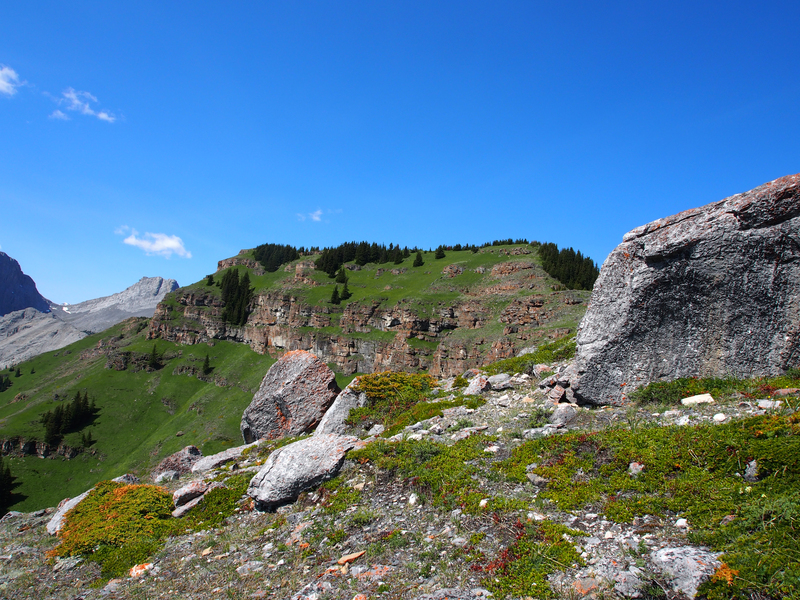 We’re building up a collection of photos and will create a separate blog post on Alberta wildflowers. They provide beautiful splashes of colour along the trail and in our landscape photographs and offer a convenient excuse to stop and catch your breath on the really steep sections! 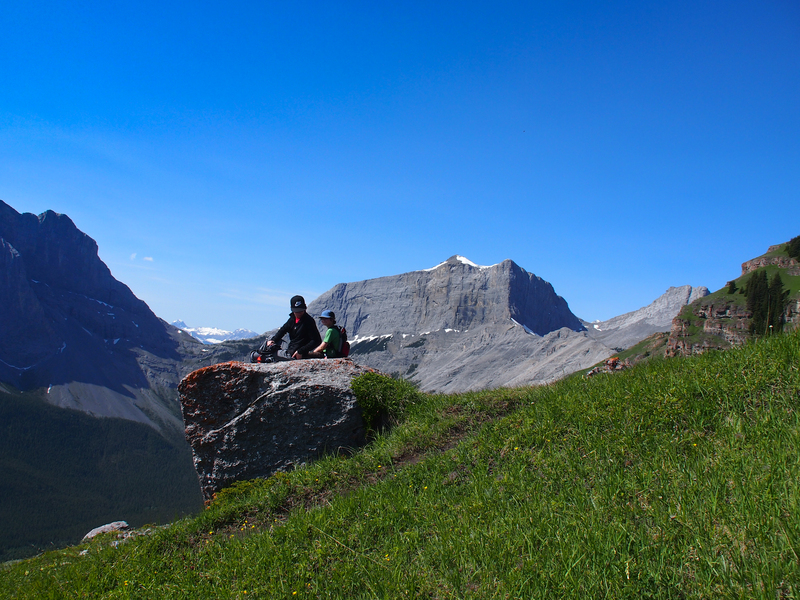 The GeoKids made it up past the crux at the rock band and decided to hang out on a large boulder, enjoying the views, while Mr. and Mrs. GeoK continued on to the higher section of Wind Ridge to search for the survey marker and geocache. After leaving the GeoKids at their chosen resting spot, Mr. and Mrs. GeoK continued on, gaining another 100 meters (or so) and hiking another 800 – 900 meters to the far end of the ridge. The next few shots were taken near BCP484 Wind Ridge and GC2E1M8 Learning to Fly. We were #8 to sign the logbook for “Learning to Fly” and it’s from this geocache write-up that we learned that portions of the video for Pink Floyd’s “Learning to Fly” were filmed on Wind Ridge! We could see our house in Canmore from the top of Wind Ridge, along with the whole townsite and the Bow River with its high water flow all the way east to Lac Des Arcs. The sun angle was pretty challenging – both in terms of the direction and the time of day, and we didn’t remember to bring any polarizer filters along, so this is as good as it gets! The large mountain across the valley is Grotto Mountain, with Graymont’s limestone quarry near the base. 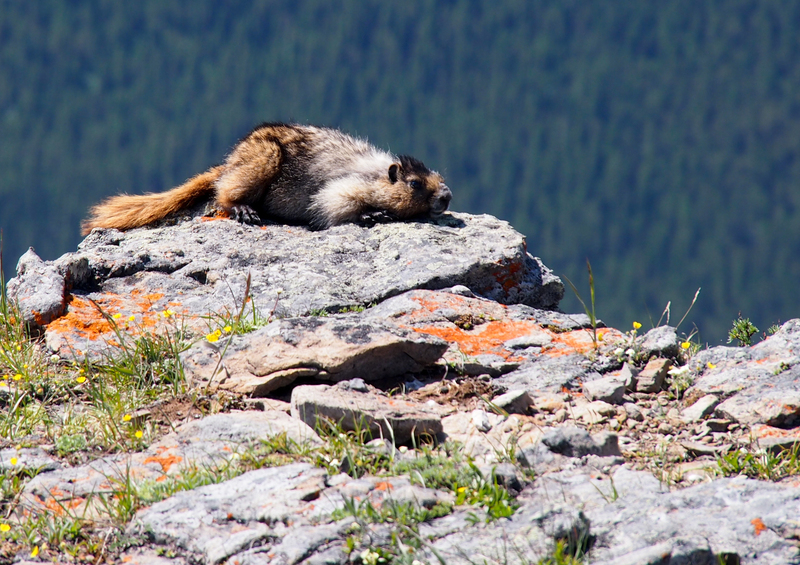 Several marmots were sunning themselves near the summit cairn, including this one who dashed off just after I took its photo. Maybe it was camera shy! Or maybe it thought I was getting a little too close. Mr. GeoK is standing just beyond the summit marker for Wind Ridge, shooting some of the other panoramas included in this blog post. 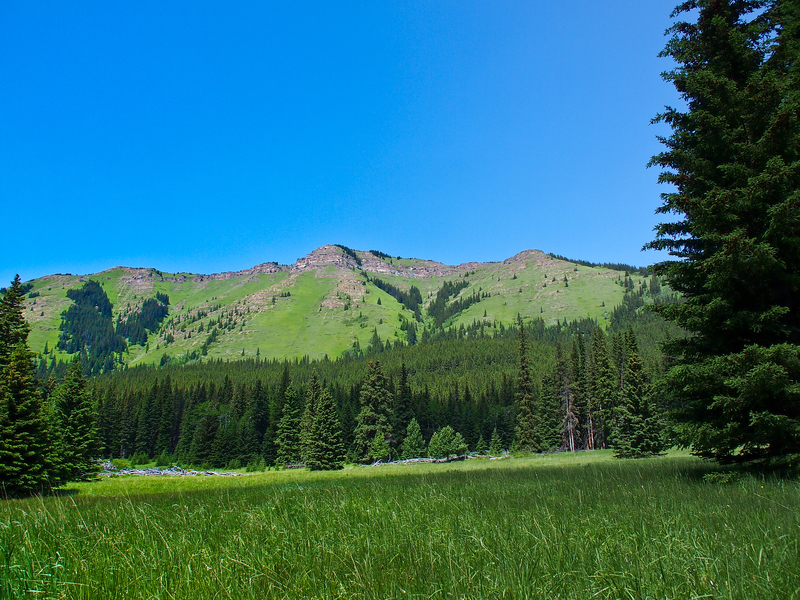 Behind him, from left to right: Windtower, Rimwall, an unnamed peak, and the Three Sisters (Big Sister (Faith), Middle Sister (Charity) and Little Sister (Hope)). And here’s a final view of Wind Ridge, taken during my 800 meter (return) side trip to find GC78DE Wind Valley, a cache placed almost 10 years ago (in August 2002) and found only 25 times to-date. It was interesting to see where I’d just been from down in Wind Valley. The rock bands are more extensive than they seemed to be from up top. Pingback: Wind Ridge and Pink Floyd?